Whoever said that getting older means you can’t enjoy the fun stuff in life? Specifically, who says you can’t go all-in on fun Halloween festivities even in your elder years? We certainly don’t believe that seniors are exempt from celebrating Halloween at Wilson Care, and even if your body is no longer what it once was, there are plenty of activities that are fun for people of all ages and body types, even for those who have disabilities. 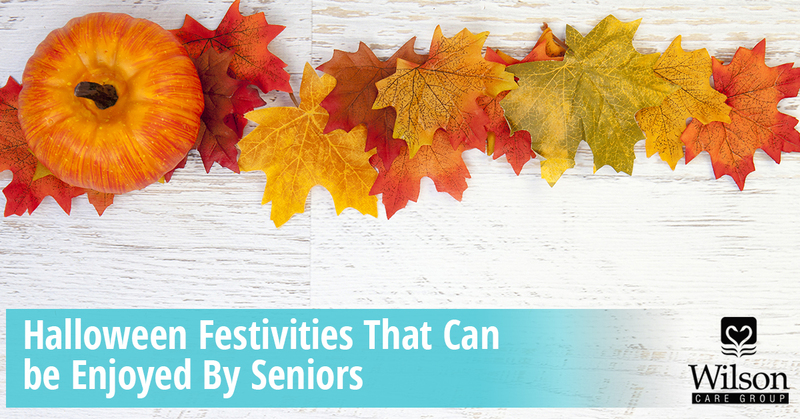 As senior home care experts, we like to make sure that every one of our senior citizens has memorable holidays that bring smiles to their faces. While Halloween is often seen as a holiday for the youthful, there are plenty of things you can do this season that will be a spooky good time. It’s only fair that we start this list off with the most “Halloweeny” activity of all — pumpkin carving! Fortunately for the elderly and disabled, pumpkin carving is an activity that anybody can enjoy, and for many people, the prospect of carving a spooky face into a pumpkin never gets old. There are some aspects of pumpkin carving that might be difficult for certain senior citizens. If you’re primarily homebound, you’ll need somebody to bring the pumpkin to you, and if your muscles and back give you a hard time on the regular, it’s definitely a good idea to avoid the heavy lifting that’s required for bigger pumpkins. The other potential obstacle is the act of carving itself — sometimes pumpkins grow thick and you need some mad forearm strength to cut through it. Fortunately, there are now electric pumpkin carvers on the market that can saw through the pumpkin like butter, providing an extremely easy carving experience. Halloween is approaching soon — time to start thinking of ideas! Tragically, age 18 is society’s general cut-off point for trick-or-treating, and if you’re in your elderly years, you’ve long been past that point. But that doesn’t mean you can’t have fun while all the kids are out! Instead of staying inside and doing nothing, consider doing something fun this year to make the night memorable for trick or treaters! Whether it’s dressing up in a fun costume, acting like a scary witch, or giving out a special treat that will make you the talk of the neighborhood, some wholesome interaction with this year’s generation of trick or treaters can go a long way. It’s the same routine every year — when Halloween rolls around, so too does the endless barrage of spooky new movies. While most of these end up being duds, there are at least one or two that leave a lasting impression, which means that you have a veritable trove of movies to choose from if you want to have a scary night. Maybe you want to go with the known classics, spookifying your night with The Shining, or perhaps you’d rather choose something that just came out this year. Whatever you choose, it sure can be a fun time watching something scary during Halloween time! Be honest — when was the last time you actually sat around and told some scary stories? This one is obviously something that you’ll need company for, and you might feel a little silly while you do it, but if you have a group that’s willing to let loose, it could be a lot of fun! Of course, not everybody has a talent for telling bone-chilling tales on the spot. To improvise a truly scary story takes storytelling talent and impeccable improvisational skills. But if there are scary tales you have memorized by heart, what better time to let them loose than on Halloween? At Wilson Care, we provide home health care services for countless seniors in the Honolulu area. While our main objective is providing essential services that everybody needs, we’d be happy to help make your Halloween a memorable one. Do you need home care services, know somebody else who does, or are interested in working as a senior home care specialist? Contact Wilson Care today!